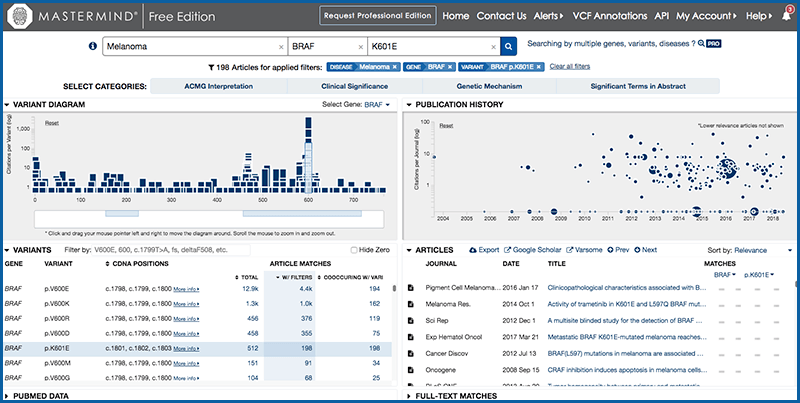 The redesigned Variant List now shows all variants found for the searched gene – with and without the current search criteria applied – making it easier to explore the full evidence-based variant landscape for your gene. When a variant is selected, it’s also easier to see which additional variants are related to the selected variant based on co-occurrences within articles that include both variants. TOTAL (1st column) lists all the articles identified in Mastermind that mention the indicated variant. This column is always present. This data reflects the maximally sensitive variant search result, and is useful to ensure no potentially useful article is missed in your search. W/FILTER (2nd Column) lists all the articles identified in Mastermind that mention the indicated variant and all other selected filters. This column is only shown when disease or keyword filters are applied. This data reflects the maximally specific search results based on all user-defined filtering criteria, and is useful to focus quickly on the most relevant articles. CO-OCCURRING WITH VARIANT (3rd column) lists all the articles identified in Mastermind that mention the indicated variant in addition to all additional disease, gene, variant and keyword filters that are currently active filters. This column is only shown when at least one variant is already selected. This data reflects the maximally specific search results based on all user-defined filtering criteria, including the additional variant indicated by row which co-occurs in articles. It is useful to quickly identify variants co-mentioned along with search for variants. CDNA POSITIONS SORT Toggle to sort in ascending or descending order by variant position. TOTAL SORT Toggle to sort in ascending or descending order by total articles. W/FILTERS SORT Toggle to sort in ascending or descending order by articles mentioning active filters. CO-OCCURRING WITH VARIANT SORT Toggle to sort in ascending or descending order by articles mentioning active filters including indicated co-occurring variants. HIDE ZERO Hide variants when both the second and the third column have zero results and the only match found for the indicated variant was from an article or articles that do not also mention selected keywords that are currently active filters. We have also added a toggle in the Mastermind Pro advanced search that allows users to switch between displaying results specifically from PubMed title, abstract, and metadata fields versus displaying results from full-text articles. This is useful if you only want to see articles where your variant of interest is mentioned at the highest level. We hope these changes will make your work easier. Do you have a suggestion to improve Mastermind? Share it with us!